Here is the pain in love: to feel compelled to protect yourself from another. Like theater, the story of each human life is either comedy or tragedy. Certainly there is a mix of both laughter and sorrow in every life, but taken as a whole, each can be placed in one of these two categories. The comedies end with the protagonist understanding the redemptive power of love. The tragedies are those in which the protagonist never opens the heart to possibility, to risk, to intimacy, to fearless emotion, to the spiritual self. My existence was not an easy one. I, with my people, lived in some of the harshest conditions on Earth, with extremes of temperature and few natural resources. We were raised to battle others over what little there was. We fought fiercely out of necessity. We roamed the desert, living a way of life that our people had done for millennia, herding, trading, traveling. But despite the difficulties and uncertainty of such a life, I remained happy and peaceful. My family thought I was simple in the head, and I suppose I was, but simple is not stupid. Without bothering to contradict them, I simply considered it a more intelligent way to live. I reveled in every moment, every sensation. At prayer time, I rolled out my rug to the east like the others, but unlike them, I did not say my prayers, not aloud and not silently to myself. I did not occupy my mind with God, but rather cleared it of everything, making myself an empty vessel, allowing myself to be filled. I smelled the air, infused with the scent of cooking fires and of the animals and of the other men, sometimes of date palms and fresh water. I felt the warmth of the rising sun or the heat of noon or chill of the wind after the dusk. I noticed the shadows as they changed throughout the day and the colors of our shelters against the orange sand. I did not worry that God would punish me because I did not say the proscribed prayers. I felt my own method was worship enough. I loved the low humming of the sand when the wind passed over the dunes. I was comforted by the familiar bellowing of the camels. I listened for the skittering, hissing noise of the beetles in the quiet of the night. I felt safe hearing the muffled conversations of women inside their tents. Not every sensation was pleasant. There was heat and thirst, naturally, but there was pain of an injury or insect bite. There was illness and eventually the infirmities of age. There was the terrifying, swirling, howling blackness of the sand storm. There were many occasions to be afraid — of nature and of men — but I rarely felt fear. I was prepared to accept whatever might be. If it was my time to die, I was prepared for that as well. I was at peace with myself and my maker. Today is Yom Kippur. Although it’s been many decades since I observed the Day of Atonement in any traditional sense, this year I spent all day listening Leonard Cohen, who is, after all, a great rabbi. Actually, I listened to one song in particular again…and again…and again, each time hearing it anew. The song, “Show Me The Place” is from the Old Ideas album. I found myself moved more deeply than any synagogue service or rabbi ever could. The song addresses the struggle shared by so many of us; of trying to remain “in the light” while dealing with the necessary mundanities of real life – earning a living, having to interact with those who test our ability to forgive, to curb our anger at life’s indignities and injustices. 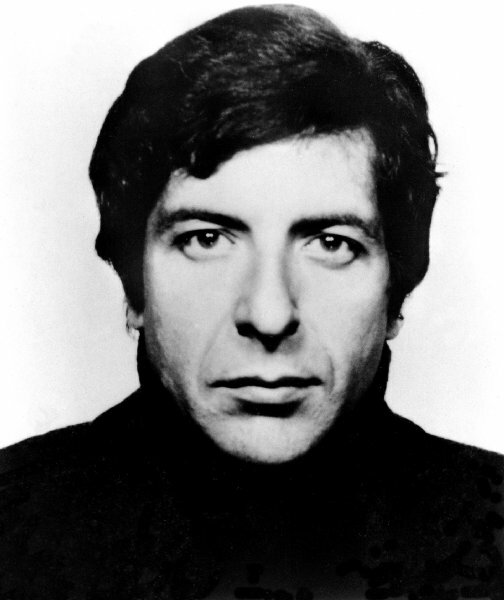 Most of Leonard Cohen’s work deals with his own quest for peace through love and spirituality; his struggle to overcome the depression, self-loathing, fear, cowardice, shame and sense of unworthiness which have plagued his entire life. His songs have always been filled with imagery of submission and slavery and supplication. In the 90s, he spent five years in a Buddhist monastery, where he eventually became an ordained monk. He credits this time of study and the Buddhist philosophy as having helped him greatly to understand his own pain and to ameliorate some of his emotional suffering. By the late 90s, he was in a good place. Then in his 60s, he had ample income from his music, and was able to devote his time to writing and recording, living a peaceful life of meditation and introspection writing about the things that moved him without financial worry, insulated from many real world distractions. In 2004, he discovered that his long-time manager, a trusted family friend, had embezzled millions of dollars, draining even his retirement account. There were lawsuits and counter-suits aplenty. One can imagine his state of mind at this time. Ripped from a life of relative peace, and thrust into nasty legal battles and heavy financial obligations to others. He had to go back on tour; back to working for others, relinquishing his well-deserved freedom. (“There were chains, so I hastened to behave.”) It’s easy to imagine him overcome with very un-Buddhist-like feelings of anger, betrayal, frustration, even hatred which must have been difficult to assuage. He may well have lost the ability to keep his depression at bay. In this song of supplication, he is entreating God to tell him where to stand so he can regain the old perspective, so he may once again live in a state of grace. It is a song of supreme sadness and pain. It put me in a tender, weepy state. Nevertheless, I’ve been listening to it on repeat for two days straight. For me (and I know many of you readers), it’s a constant struggle to forgive those who need forgiveness most; to open my heart to those who hate or who have hurt me. I work every day to separate the needs of my ego from the path of my higher self. Although I would be most content spending my days in spiritual contemplation, I must work to make a living, often forced to deal with people who fill me with some very UN-spiritual thoughts. This song is a hymn to that struggle in all of us – to hold on to the Light in the face of darkness; to truly live in the light and not just pay it lip service. I don’t always win that battle, and the losses are always filled with pain. FYI, Leonard has a new album out next week. Click to order. Thank you for visiting. If you enjoyed this post, please follow the blog and/or sign up to receive email posts. New posts every three days, and they are getting more and more interesting. I promise! Comments are welcome here or at https://www.facebook.com/livesofthedead. If you know anyone who would enjoy or relate to this, please forward and/or share on Facebook or Twitter. Thanks! My entire life was a lie, and I didn’t even know it until I was well into my autumn years. I was the youngest of four children. As the baby of the family, I should have been the most adored and pampered, as is often the case, but not so for me. My father, in particular, barely acknowledged my existence. When he did, is was mostly to scold me or to point out the ways in which I was lacking. There was no love from him. My mother rarely came to my defense. Though my siblings were usually kind to me, they were much older, and they no longer lived at home when I needed support and encouragement most. The conclusion I drew from this mistreatment was that I was unworthy of praise and of love; that I was a disappointment to all. I was never quite certain exactly what about me was wrong or lacking but the specifics didn’t matter so much as how I felt about myself. I lacked confidence. I second-guessed myself at every turn. I mistrusted the friendship and love of others. My relationships were painful and disappointing and never ended well for either of us. I never doubted that the cause of my unhappiness and alienation was the result of my own inadequacies. I staggered under this burden, carried heavy on my shoulders, for most of my life. When I was nearly seventy, my mother’s sister, lay dying. My parents were already long gone. My aunt asked to see me before she passed on. I sat at her bedside, holding her hand, and she told me the secret which she did not want to take to her grave. Before I was born, my parents’ marriage was faltering, and my mother had an affair with a man she deeply loved. When Father discovered her infidelity, he was deeply hurt and angry, as is normal in such situations. If her situation had been different, she might have run off with her lover, but he was in no position to care for her and her three children. So my mother had no other option but to end the affair and humble herself before my father. She begged for his forgiveness, promised to be faithful. He took her back and she committed herself to being a good wife. Soon after, she discovered she was pregnant. Although she always maintained I was my father’s child, conceived when she returned to their marital bed, she and my aunt knew the lie. They justified the secret, believing it was in everyone’s best interest. Given the circumstances at the time, I suppose it was. What choice did she have? But my father was not a fool. He did the calculations and discerned the truth. Although it was never spoken of, my mother and my aunt assumed he knew. As far as I and everyone else knew, I was the product of their loins, but it was in this lie where my own troubles were born. And there, at my aunt’s deathbed, I understood suddenly and clearly that my father’s disdain for me had nothing at all to do with who I was but only what I represented. Every time he looked at me, he was reminded of my mother’s betrayal. How painful and humiliating it must have been for him to raise another man’s child, to feed it and clothe it, to pretend I was his when he knew not an ounce of his blood ran through my veins. Each time he looked at me, he was reminded that he was a cuckold. And my mother, too guilty to come to my defense. My anger and hatred towards him evaporated and was replaced by pity and a deep, existential sadness that lasted to the end of my days. I’d wasted almost my entire life believing a lie, oblivious to the damage it wreaked upon me. Also, I have just started a discussion group on Facebook, for conversations about any of the concepts/issues in the posts. Honestly, these are things in here which I don’t fully understand myself. I would love get your thoughts on this…even if you think this is all a bunch of hooey! Feel free to post/ask/suggest/comment. To achieve great wealth and power in a human lifetime, one must be almost single-minded in such a pursuit, desiring these things above all else. These wants are driven by the ego — the gratification of rising above and having dominion over others. The satisfaction derives from the mistaken notion that greatness in one’s lifetime makes one superior to their fellow man. But human achievement is not equal to spiritual achievement. In reality, one likely precludes the other. The more one appeases the ego, the less one is able to develop spiritually. Observe the very rich, the very powerful — politicians and kings, religious leaders and giants of industry. It is easy to recognize how disconnected many of them are from the purest part of their own souls. They fill the void with the spiritual equivalent of empty calories – material goods, status, , with the game of bending others to their will. And although they may have greater ability to shape the world to their whim and even direct the course of history, once on the other side they hold no special status except as having been a tool to move along the story of humankind; a tool of the universe. To covet anything –even serenity and spirituality — is to accede to the ego.